It was during my initial days in Australia..once, hubby had brought a vegetable called 'Turnip' to home. I thought its a new variety of vegetable which I never used earlier. Its outer skin was purple mixed white, but the veggie tasted something similar to our Indian vegetable - 'Navilukosu'. Then I got the info from the net that Turnip belongs to the same family of Navilukosu. Turnip is well suited for Indian dishes like Paratha, Sambar, Hashi, etc. My little daughter is a big fan of Roti and Parathas. She will accompany us for breakfast and dinner and loves to eat little bytes of roti or paratha. My hubby also likes to have roti / paratha for dinner. So, Roti / Paratha has become part of our dinner these days. 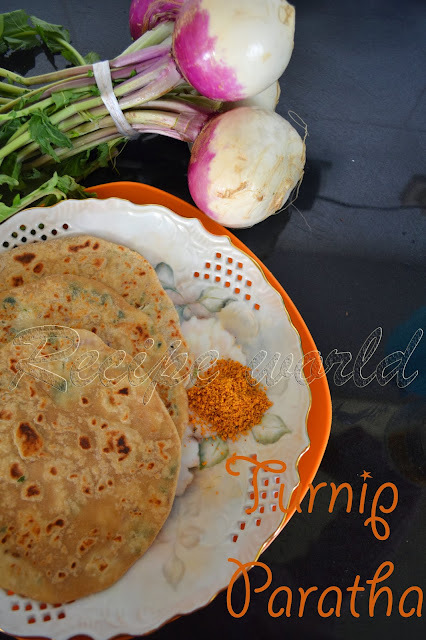 Turnip is one of the vegetables which I frequently use for preparing Parathas. Below is the recipe of Turnip Paratha. 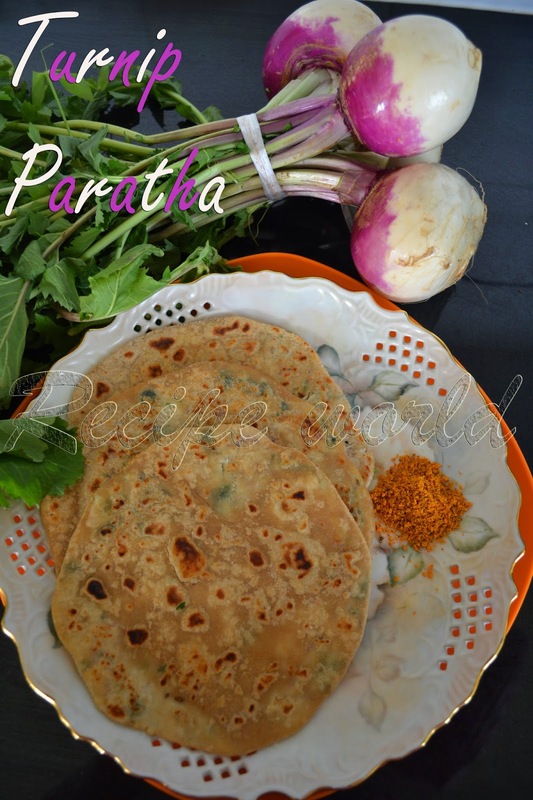 Try this delicious paratha and I am sure you are going to like it! Grate the Turnip using a Grater. Mix it with salt and chopped coriander and keep aside for 10 minutes. Then, squeeze of all the excess water from the mixture. Retain this water so that you can use it while preparing the covering dough. Take the stuffing mixture in a bowl. Add crushed green chillies and mix it nicely. Check the taste and add little salt if required. Now, the stuffing mixture is ready for use! Take the wheat flour in a mixing bowl. Add salt and oil and mix it nicely with your hands for 3 – 4 minutes. Add water little by little and prepare a smooth, non-sticky dough. Keep it aside for at least 10 minutes before using. Divide the stuffing mixture into 9 or 10 equal portions. Divide the dough also into same number of equal portions. Prepare the dough balls and roll them half way. Put the stuffing mixture in the center of the rolled dough and cover it properly. Pat the prepared ball little bit with your fingers and keep aside for 2 minutes. Follow the same procedure till all the stuffing is done. Roll the stuffed dough balls into slightly thin circles using a rolling pin. You can use some dry flour for dusting. Heat the tava on medium flame. Transfer the rolled paratha onto the hot pan and cook on both the sides till golden brown. Drizzle few drops of ghee or oil while cooking the parathas. Serve the hot parathas along with your favorite side dish!